Figure 1: Settings dialog - Instruments - Oscilloscopes. The time/div setting of the oscilloscope adjusts both the sample frequency and the record length of the scope. Because a certain time/div setting can be created from different combinations of record length and sample frequency, the Multi Channel oscilloscope software must decide which combination is used. The software will try to use the highest sample frequency possible and will adjust the record length accordingly to obtain the required time/div setting. 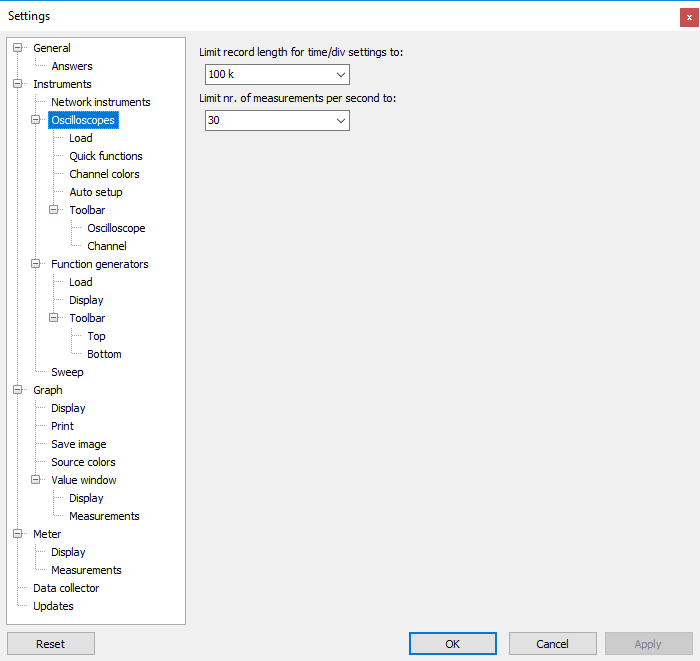 To avoid the record length becoming this long that collecting the measured values takes longer resulting in the scope responding slower, the record length for time/div settings is limited. When the time/div setting is adjusted by one of the corresponding controls, the maximum record length is limited to this value. Depending on the instrument and used driver, the number of measurements an oscilloscope can perform per second (in block mode) can be limited to a specific number. This limits the maximum load of the Multi Channel oscilloscope software on the computer.